If you have the Series 3 shaver from Braun, you know it’s a great shaver. You might be tempted to stick with the Series 3 forever. You wouldn’t be wrong in your assessment that the Series 3 is a fantastic showing from Braun. They make significant improvements and advancements in every Series, though. Sticking with the Braun Series 3 vs checking out the Series 5 would be a mistake. We’ll show you the differences in various models head to head then focus on the improvements that Braun has made to the Series 5 that should be given your consideration. It’ll be worth the read. At the end of this comparison, you’ll see that the Series 5 is a better option. The Series 3 and Series 5 have some very important features in common. Braun has created the Series 5 as an advance on the Series 3. 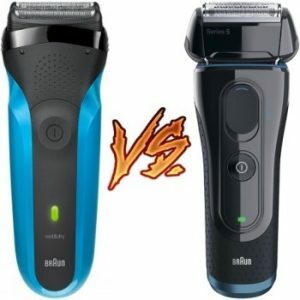 When looking at the two shavers, the similarities will be compared first. The Series 3 3040s has advanced, specialized shaving elements. It gives you a close shave while protecting the skin. The blades sit behind a SensoFoil that will smooth the skin and protect the face. It’s technology that Braun has perfected for all their shavers starting with the Series 3. It’s available in all the Series 5 shavers, too. There are 899 openings in the foil. They allow hair to enter while smoothing the skin of the face to avoid nicks and cuts. The shaving head of both Series 3 and 5 will flex in 8 directions. This keeps the shaver in constant contact with the skin. When you don’t have to make multiple passes across the face, you’ll avoid irritation. It’ll give you a clean shave without razor bumps. Shaving in the shower can be done with both these shavers. They’re waterproof for cleaning as well as shaving. Whiskers that are warm and wet are easier to cut than dry ones. It’s a great way to get the closest shave possible. The Series 3 3040s and 5 5190cc both have precision trimmers on the handle itself. You won’t lose any attachments for shaving when the trimmer is right on the shaver. The trimmer makes the shavers great for all your grooming needs. Edging the sideburns or around a goatee or mustache is possible with the trimmer. The Series 5 5190cc has some advanced features that aren’t available in the Series 3 3040s. It has an AutoSensing motor that will give you more power in areas where your beard is denser. That’s new technology that isn’t found in the Series 3 3040s. The Series 5 5190cc has an ActiLift Trimmer, too. This middle trimmer lifts flat hairs and pulls all your whiskers in one direction. When hair is lifted and directed in the right direction, it’ll easily slip into the foil for cutting. 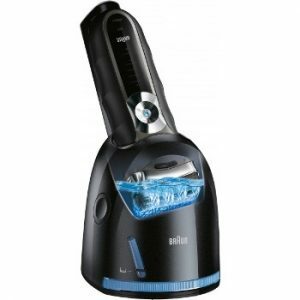 In terms of cleaning the shaver, the 5190cc has an included cleaning and charging station. The cleaning and charging station of the Series 5 is a 4-action unit. It will clean and sanitize as well as dry and charge. That’s one of the biggest advantages of the 5190cc. It keeps the shaver like new for longer before you’ll have to buy a replacement shaving head. 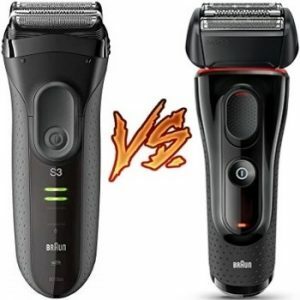 The 3050cc and the 5030s are good shavers because they’re made by Braun. It’s a company that makes improvements each time they create a new shaver. The 5030s has more technology than the older Series 3, though. 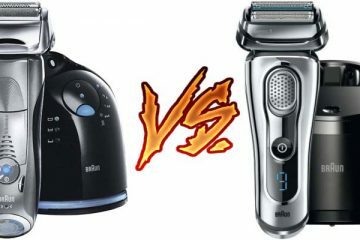 Let’s cover the similarities before uncovering the differences in the two shavers. First, the 3050cc and the 5030s have an ergonomic grip. The shavers won’t slip from your hand when the handle is wet. That’s vital when you’re shaving with foam or gel. Your hands will get wet. They both have built-in precision trimmers, too. Instead of having to add attachments, the trimmer is available right in the handle. You’ll never lose it. It won’t take up precious morning grooming time to find the attachments and change it. Specialized shaving elements are a feature on all the shavers from Braun. The SensoFoil protects your skin from the razor-sharp blades. There are plenty of openings in the foil to allow hair to be cut easily, though. The Series 3 and Series 5 both have features that are focused on the comfort of the user. Those who are sensitive will find that the Series 3 has pressure sensitive blades that retract if you put too much pressure on your face. The Series 5 has an 8-direction comfort head. It moves gently along the curves of your face. The one benefit that the Series 3 3050cc has over the 5030s is the cleaning and charging station. Unlike some of the newer Series shavers, the 3050cc has a 3-action docking station. It will clean, lubricate, and charge your shaver. The 3050cc has MicroComb Technology, which brings in more hair for the blades to cut. While it’s a good feature, the ActiLift trimmer is more advanced. It’ll actually lift hairs that are stubbornly lying down against the skin. Your hair grows in a variety of directions – especially in certain areas like the neck. The 5030s has a MultiHeadLock that will allow for 5 angles. 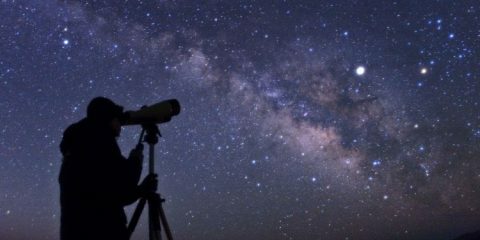 Once you find the perfect position, it will lock into place. 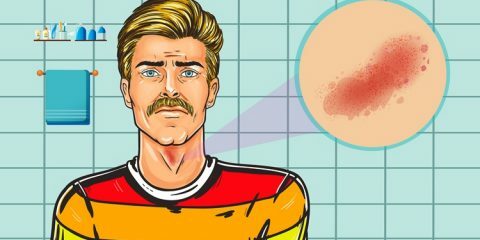 This feature gives you a more accurate shave in areas like under your nose. The 3050cc doesn’t have an adaptable shave head. It doesn’t move at all, so there is no need to have it fixed in position. The battery for the 3050cc is a NiMH that gives you 45 minutes of shaving after 60 minutes of charging. The 5030s has a Li-Ion battery that takes 60 minutes to charge, too. It gives 50 minutes of shaving time, though. They both have the ability to charge quickly in 5 minutes for a fast shave. The 5030s can also charge while in use. That’s not a feature for the 3050cc. The Series 3 310s is an older shaver that has some great features because it was manufactured by Braun. They’re known for their German engineering and advanced technology. The 310s has an ergonomic grip that is a feature of all Braun’s shavers. The 5040s has the same ergonomic handle with their patented dot texture. There are other similarities between the 310s and the 5040s. You can rinse the shavers under running water to get them clean. It’s possible to shave wet or dry with these shavers, too. The case can handle wetness, which is a great test for the ergonomic grip. That’s where the similarities between the shavers ends. The 5040s has a precision trimmer on the back of the handle. It’s a great addition to the Series 5. You don’t need to remove the shaver head, find the trimmer, and attach it to the shaver. It’s simpler with the trimmer attached. You can edge your sideburns, goatee, beard, or mustache. The Series 5 5040s has an AutoSensing motor that takes note of the thickness of your beard and adjusts itself accordingly. It’ll adapt for the density automatically. You won’t have to do a thing. It’ll intuitively give you a close shave even in areas where your whiskers grow in thicker. 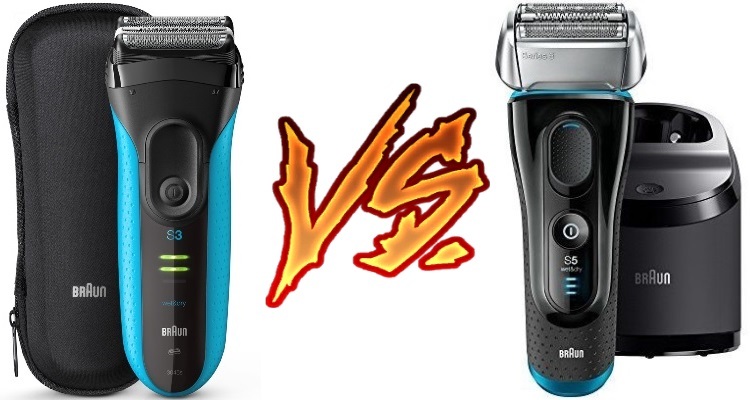 The 310s doesn’t have a sensor to change the power of the shaver. In the 310s, you’ll get a 3-flex head. The three heads move independently of the one next to it. The flex heads make it possible for the shaver to stay in contact with the skin. They’ve gone a step beyond with the Series 5. The shaving head of the 5040s moves in 8 directions. The 8-D flex head ensures that you’ll get the closest shave possible. The 5040s has an ActiLift trimmer. The 310s has a small element that will direct some hairs for a better shave. The ActiLift takes that a thousand times past the other shaver. It will lift and direct flat hairs into the foils. Your hair grows wild in some areas. It never grows the same direction, which can make shaving some areas very difficult. The 5040s has a charger that lets you shave while you’re charging. While this is a wet/dry shaver, it’s not to be used in the shower with the plug in the base. That could be a real problem. Electricity and water are never a good combination. You can certainly use the shaver at the sink with shaving foam, though. The 5040s has other features that make it a great shaver and better than the 310s. There’s a travel lock available for those who travel with their shaver constantly. The display for the battery is more advanced, too. In some models of the Series 3, you’ll find that there is no movement in the shaving heads. They’ll retract if the user presses too hard. Otherwise, they don’t stay in contact with the skin as well as other models. The Series 5 features 8-direction heads. The shaving elements move independently from the one next to it. The entire head also moves. In some models, the head can also be locked into position for precision cuts. The cutting elements in the Series 5 are more advanced than those in the Series 3. The Series 3 has 3 shaving elements while the Series 5 has 5 shaving elements. One of the shaving elements in the Series 5 is the ActiLift, which isn’t available in the Series 3 models. It actually separates and lifts hairs for cutting. Even those that are flat against the skin are the focus on the elements. The handle displays of the Series 5s are more advanced than the handle displays of the Series 3. The Series 3 have a simple light that will alert the user when the battery is low. The Series 5 models have indicator lights that will let you know when you are coming close to needing a charge. There are 5 lighted areas for indicating how much longer you have for shaving time. The Series 3 and Series 5 models have approximately the same amount of charging time needed to have their batteries filled. The charging time is 60 minutes. The amount of time that gives you for shaving will differ based on the model. The Series 5 models will have between 45 and 50 minutes of shaving. The Series 3 models have much less time. They range around 20 to 45 minutes. Not every model in either series comes with charging and cleaning stations. Docking stations that charge and clean come with the models that have cc in their names. When the Series 3 models have a charging station, they have a 3-action feature. They’ll clean, lubricate, and charge. The Series 5 models with cc in their model name have a 4-action feature. They’ll clean, sanitize, lubricate, and charge between uses. Series 3 models do not always have a precision trimmer attached directly to the handle of the shaver. The Series 5 models have built-in trimmers. Trimmers attached directly to the handle of the shaver don’t get lost. They slide quickly out of the handle to let the user continue quickly grooming his face. The trimmer is a great way to get the most out of your morning grooming routine. 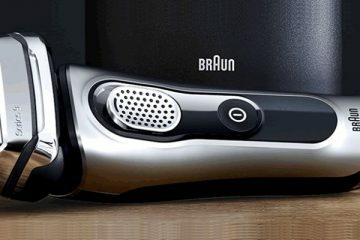 All of Braun’s shavers have a wet/dry component to them. They can be used with shaving foam or gel. The shavers can be rinsed under a running faucet to ensure that they’re clean. A shaver that’s been cleaned after every use will perform better. Not all shavers in the Series 3 or Series 5 are 100% waterproof enough to take into the shower or be submerged. It will depend on the model’s features. The cutting elements in the Series 3 and 5 models are quite flexible. In some of the older Series 3 shavers, the cutting elements will retract if there’s too much pressure. They won’t move independently. The later models of the Series 3 as well as the Series 5 cutting elements move in a variety of directions. The Series 3 has 3-direction movement. The Series 5 has 8-direction movement. In the Series 3, the middle trimmer isn’t as advanced as the ones available in the Series 5. All the features they have in common are more advanced in the Series 5. That goes for the trimmer. The Series 3 trimmer will gather the hair for cutting. The Series 5 trimmer will actually lift hairs that are lying flat to make the stay in place for cutting. That’s a feature that all men can appreciate. Hair never grows in the same direction, and some of them are unruly. The Series 3 and Series 5 are both washable. It’s simple to rinse them under a running faucet. The shavers might not end up being 100% waterproof or able to go into the shower. It’ll depend on the series model number. For the most part, all Series 5 shavers have the ability to be submerged. It’s important to be able to take your shaver on the road. Many Series 5 shavers have lock buttons that make them travel-friendly. They all come with storage for tucking the shaver into your luggage. Not every man will travel with an old-fashioned toiletry kit, but he’ll want to travel with his favorite shaver. The Series 3 and Series 5 are easy to care for on a daily basis. They are simple top open and come with brushes. That makes it easy to brush hair out of the cutting elements if you dry shave. For wet shaving, the Braun shavers can be rinsed under a running faucet. Some Series 3 and Series 5 options come with a cleaning and charging station. It makes it much easier to sanitize and clean the shaver, so it’s like new for longer. If you don’t want to take the time to clean then manually charge the shaver, pick one that has a station included. When it comes to charging, the Series 3 and 5 come with special chargers that will give you a charge after only an hour. Some of them come with a fast charging option for a 5-minute, quick shave. If you’re looking for a shaver that’s easier to maintain, the Series 5 has more advancements in terms of battery, charging, cleaning, and maintenance. The Series 3 is simpler with less bells and whistles than the newer models. 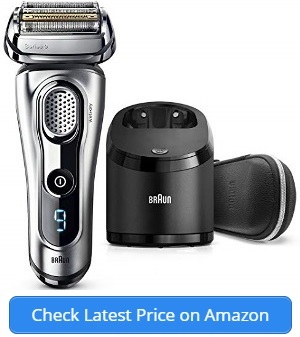 If you currently own a Series 3 model shaver from Braun, you’ll definitely want to upgrade. Everything you love about the Series 3 is enhanced and expanded in the Series 5. If you love the way the Series 3 moves along your face with the contouring, you’ll find that the Series 5 does it better. The Series 5 gives you more shaves per charge. 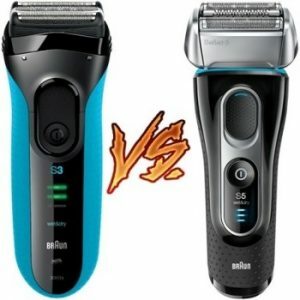 It gives you a better middle trimmer that will give you a closer shave. The 5 Series has a more detailed handle display, too. The travel case is more luxurious. The charging and cleansing station has more actions. Every plus and benefit you have with the Series 3 is a step above with the Series 5. Some of you came here wanting to be convinced that you can get a good shave if you stick with your old Series 3. You won’t find that’s the case. The Series 5 is a superior range of shavers from a company that is constantly striving to enhance their shavers from series to series. The Series 5 is a better range of shaver overall no matter which model you choose.